Artisanal food fairs and shows are fun. I like discovering new and hot products and enjoy hearing the stories of food entrepreneurs. And product sampling, particularly when Sweets are involved, is just gilding the lily! From the vantage point of food entrepreneurs, these shows can be a great way to build demand and ultimately generate wider distribution for their products. (I know I usually wind up purchasing at least a few treats, but I digress.) Also see the Dessert Surveillance posting on The Big Chocolate Show. At the Artisanal Sweet Treats Bazaar in New York City, I was surprised to see so many vegan and healthier Dessert offerings. 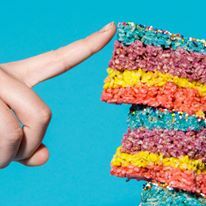 Brooklyn-based Pure Genius crafts Brownies and Blondies that are high in protein and fiber and relatively low calorie. They are also vegan, gluten-free, nut-free, and soon to be verified non-GMO. What makes them high in protein and fiber? Chickpeas. 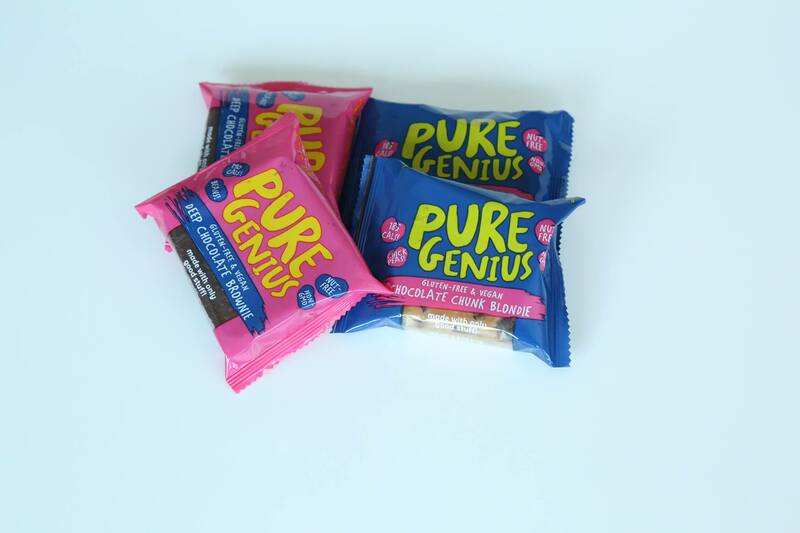 Pure Genius’ founder, Nancy Kalish, has a sweet tooth but wanted to eat healthier Desserts. She didn’t like what was available so she decided to create some healthy but much tastier options herself. After hundreds of attempts, Pure Genius was born. Different flavors/varieties are in the works. Currently, Pure Genius’ Brownies and Blondies are available in Whole Foods stores in New York, New Jersey, and Connecticut, and in other stores in the Northeast and Southeast. For those wishing to indulge in more decadent Desserts, the Artisanal Sweet Treats Bazaar delivers. Choices include Cupcakes, Bruffins (a brioche-like pastry with fillings), Brinkles (amped up rice cereal treats), Macaroons, Macarons, and more. 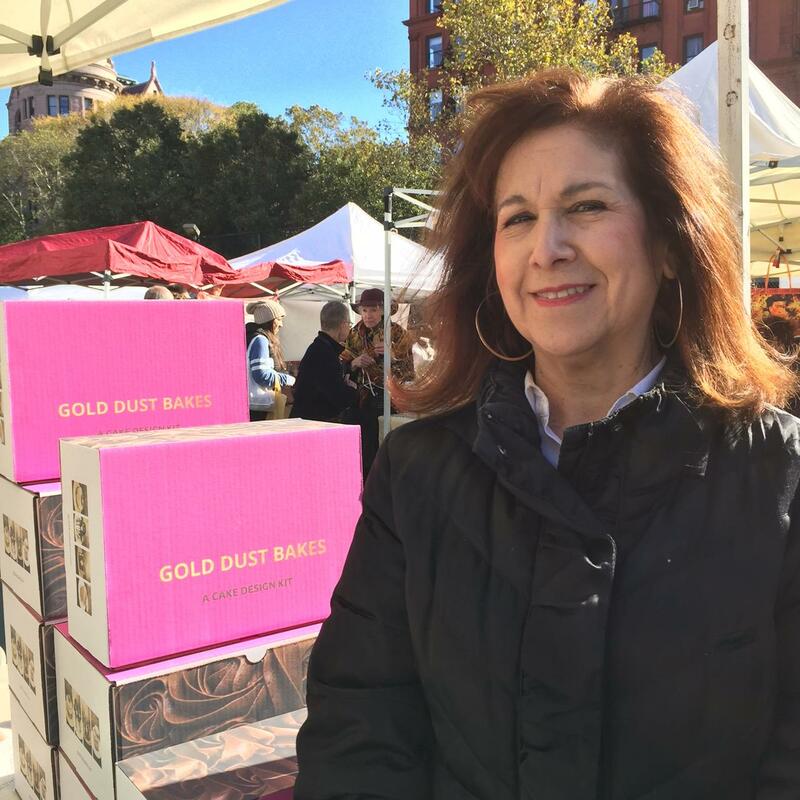 And if your tastes run more to elaborate, show-stopping layer cakes, you can create them yourself – with some help from New York-based Gold Dust Bakes. This firm offers Cake Design Kits, which include a design for a Cake, a photo of it, detailed instructions, and the items needed for decorating it. You supply the basic Cake and Frosting. Six different core designs are available, with a new and different design rotating each month. Founder Rhona Hershkowitz, is an interior designer as well as a skilled baker and cake decorator. Her goals are to help bakers gain confidence in their Cake decorating skills as well as build a community of people who love to bake. As Rhona notes: Baking transports us to another world and is making us happier. I know baking makes me happier! Enter your email address to follow the Dessert Surveillance Blog and receive notifications of new posts by email.